Opal is a mage who makes her livelihood as a Cleaner, bidding for the right to empty and clean abandoned apartments. While she gets to keep the contents to sell off, it’s a gamble whether any auction will be worth its price. Bonanza or bust, this time around Opal has emptied the bank to bid on a couple of properties and there’s no margin for error. While she has an advanced degree from the premier magic university, she’s struggling to pay off her massive student debt month by month. This month it’s harder than ever, due to a five-month streak of bad luck and apartments full of worthless junk. If Opal doesn’t make her payment on time, a rather ill-tempered gentleman – her father, is going to foreclose on her freedom for good. Opal has only a few days left to make it or break it. And Opal just might be the one getting broken. Her latest acquisitions, and the murdered professor who owned them, have drawn the interest of several heavy hitters, including criminals, a competing cleaner, and a couple of rather touchy gods. Minimum Wage Magic (DFZ Book 1) takes place in the world of the Heartstrikers series (Heartstrikers is such an appropriate name for that dragon clan!). If you haven’t read the Heartstrikers series, which starts with Nice Dragons Finish Last, Minimum Wage Magic includes enough background that it can be read on its own. However, you’ll want to grab the Heartstrikers series and read them while you’re waiting for the next DFZ book, because you can never get too much Rachel Aaron, DFZ goodness, or dragons. 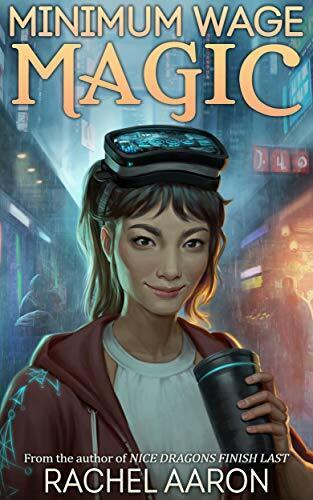 Minimum Wage Magic is an enjoyable mix of fantasy and cyberpunk with immersive world-building and believable characters. If you’re familiar with Rachel Aaron, then you know the first books in her series, while chock full of incredibly complex characters and worlds and mesmerizing in their own right, have storylines that only hint at the complexity, character growth, and world-building to come. Minimum Wage Magic is an entre in a whole new feast. Highly recommended for anyone with an appetite for science fiction and fantasy or the joy of great storytelling. Rachel Aaron never disappoints. I received this book as a digital Advanced Reader Copy (ARC). My opinions are my own. The DFZ, the metropolis formerly known as Detroit, is the world’s most magical city with a population of nine million and zero public safety laws. That’s a lot of mages, cybernetically enhanced chrome heads, and mythical beasties who die, get into debt, and otherwise fail to pay their rent. When they can’t pay their bills, their stuff gets sold to the highest bidder to cover the tab. That’s when they call me. My name is Opal Yong-ae, and I’m a Cleaner: a freelance mage with an art history degree who’s employed by the DFZ to sort through the mountains of magical junk people leave behind. It’s not a pretty job, or a safe one–there’s a reason I wear bite-proof gloves–but when you’re deep in debt in a city where gods are real, dragons are traffic hazards, and buildings move around on their own, you don’t get to be picky about where your money comes from. You just have to make it work, even when the only thing of value in your latest repossessed apartment is the dead body of the mage who used to live there.